If you are a KPU student and you’re reading this, it is statistically probable that you use a U-Pass card to transit to school. According to TransLink’s 2017 annual report on the U-Pass program, 61 per cent of KPU students who paid the U-Pass fee used their cards. The report also shows that, in the fall 2017 semester, an average of 13,203 KPU students were eligible and paid the monthly fee of $41.00. Of those eligible, 61 per cent used their pass, eight per cent enabled but did not use it, and 31 per cent did not enable or use it at all. A TransLink three-zone pass costs $174.00 per month, meaning that students who use the pass regularly save $133.00 a month. If approximately 61 per cent, or 8,054 eligible students, used their passes in the fall semester, they would collectively save $1,071,159 per month—or $4,284,637 over the entire semester—by not paying the regular fare for a three-zone monthly transit pass. Approximately 4,092 students paid the fee without using the card, which means that over the course of the fall semester, $2,848,679 was collectively paid by students who did not use the program. The contract for the U-Pass program is up for renewal and will require a monthly fee increase of $1.50 plus two per cent per year starting on May 1, 2020. Noah Berson, Vice-President of External Relations for the Capilano Students Union and U-Pass Student Co-Chair, says that students who make use of the pass generally use it at least 20 times a month, and that the fee increase matches a general increase in TransLink fees across the region. “It’s a steep fee increase that is far less than TransLink is increasing their fees, which is excellent,” he says. The 2017 report also found that the U-Pass program is linked to a measurable reduction in greenhouse gas emissions—from 9,652 tonnes in 2016 to 10,998 tonnes in 2017. David Piraquive, KSA Vice President Student Life, says that he is in favour of students voting “yes” on the referendum question. The KSA also offers exemptions and hardship bursaries available for students who meet certain criteria. However, as KSA Executive Director Ben Newsom points out, exemptions are different from opt-outs. 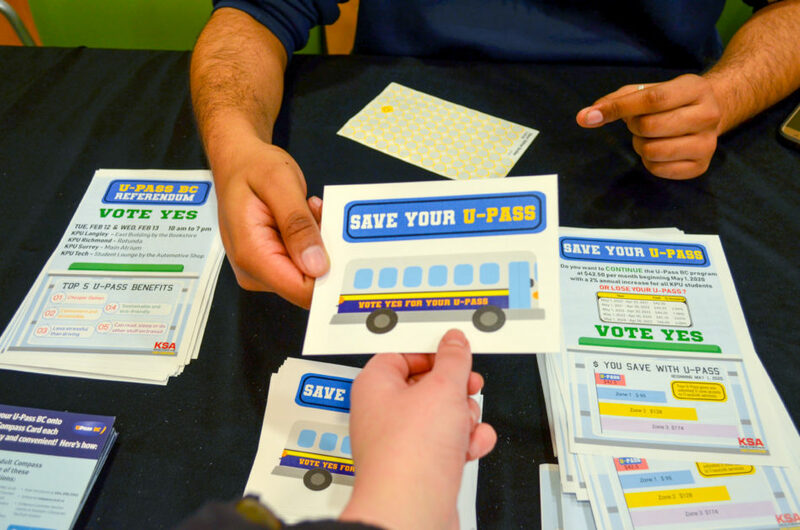 The on-campus referendum on Feb. 12 and 13 will ask students to vote on this question: “Do you agree to continue the U-Pass BC program for all eligible Kwantlen Polytechnic University students at $42.50 per month beginning May 1, 2020; and allow for up to a 2% annual increase (with fees rounded to the nearest nickel) thereafter?